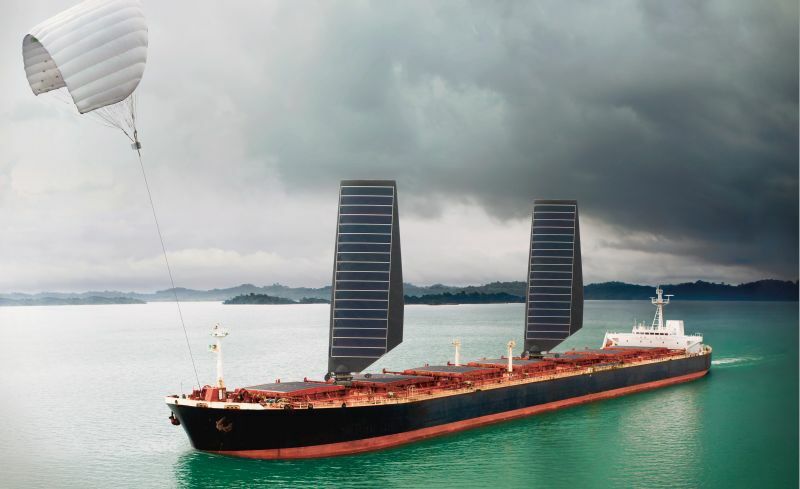 A hybrid bulk carrier powered by solar energy and a sail. The sail concept is already being tested. Credit: SolarSailor, Australia. We live in a time of pessimistic artistic visions of the future. TV viewers and readers flock to the dystopian worlds of a zombie-infested Walking Dead or Margaret Atwood’s Maddaddam trilogy, which foresees a wrecked climate, out-of-control superbugs, and extremes of wealth and privation. The popularity of these fantasies reflect, at least in their depiction of climate change, a reaction to the finger-wagging by scientists and activists angered by humanity’s failure to address the problem. Wallowing in a dark universe massages a Calvinistic guilt in media consumers helpless to do anything about these overwhelming problems. The opposite was true a generation ago, at least on television, when the fictional vision of the present and future was relentlessly optimistic. In Star Trek, Captain Kirk ventured forth from a 22nd century utopian Earth free of war, poverty, and disease. The characters may fight monsters or aliens, but human impulses were fundamentally good, and everything turned out well in the end. If the depicted culture faced something like global warming, people came together and fixed it without much fuss. That’s the case in a new book by leading environmentalist Jonathan Porritt, who harkens to a time when the future was non-threatening, even exciting. In The World We Made: Alex McKay’s Story From 2050, published by Phaidon, Alex McKay, a fictional teacher living in 2050 Great Britain, recounts how the human race finally understood the dangers facing the planet and made the choices necessary to fight and reverse climate change, while taking swipes at poverty, disease, unemployment, and other chronic problems. In The World We Made, the end of the world is not nigh. The book’s concept is almost identical to Edward Bellamy’s influential 1888 novel Looking Backward, a staple of high school literature courses in the U.S. Bellamy tells the story of a young 19th century man who falls into a deep sleep a la Rip van Winkle and wakes up in Boston in the year 2000. He learns about all the technological and societal changes that have taken place in the previous century. The heart of Looking Backward is a utopian economics that commentators call “marxist” or “socialist.” The World We Made is neither, but it definitely leans left, an attitude that will drive conservatives and libertarians mad, particularly its call for new taxes on wealth and transactions, increased regulation of carbon, and the elimination of overtime work. Those same conservatives ought to pay close attention to Porritt’s prediction that China will become a premier force for environmental good. With its aggressive attitude toward planning, Porritt sees the country overcoming its horrendous environmental degradation, as witnessed by the sickening air pollution plaguing its major cities today. In contrast, the U.S. trails the rest of Porritt’s world, though it eventually catches up. Technically fiction, The World We Made is better understood as “speculative non-fiction.” We know very little about the narrator, Alex McKay, beyond a few personal details. Dialog and conflict are almost non-existent. The main emotion is relief, as in, “We dodged that bullet.” The full-color images always have sunshine and smiles, and the graphs always show things getting better. A number of unnamed research assistants regularly exclaim, “What were they thinking?” when discussing the poor choices made in the years before humans got religion on sustainability. It may be a stimulating read, but it isn’t storytelling. Knee-jerk skeptics will find something to mock on every page, such as a claim that humans will always perform certain rote tasks, such as disassembling electronics for recycling, because robots couldn’t be made smart enough. Porritt needs to spend time in a room of teenage robotics engineers to understand his mistake. But cynics would be missing Porritt’s point. He’s arguing that the enormous problems faced by Earthlings are solvable. Most of the tools already exist, if only people work up the will and the sense of urgency to pick up the tools and use them. The World We Made will encourage people who want to work toward a positive future. Is it time to bring back utopian science fiction? Leave a reply below. Is it time to bring back utopian science fiction? YES! Nice review, Joe, very well done. Is the book CLI FI or SCI FI or “speculative non-fiction.” Good questions. And yes, this book offers solutions and a hopeful view of things. BRAVO. BY THE WAY have you heard that Margaret Atwood coined a new word a few years ago she calls USTOPIA, which she says is a combo of dystopia and utopia, or the other way around. SMILE. google it. her term. I had not heard of “ustopia.” I’ll check it out. Atwood coined it herself a few years ago, she meant to combine utopia and dystopia, for USTOPIA, but i am not sure if ever caught on as a buzzword, but she has used it in her own writings, google her name and the word. I got around to reading Atwood’s 2011 essay in The Guardian about “ustopia.” I’m mostly confused, and don’t think the argument on whether her work is scifi is useful, anyway. It smacks of the “angels on the head of a pin” debate.